Some more minor changes and bug fixes. Now I will work on some new game elements. Fixed a bug where the life counter reset when the level changed. 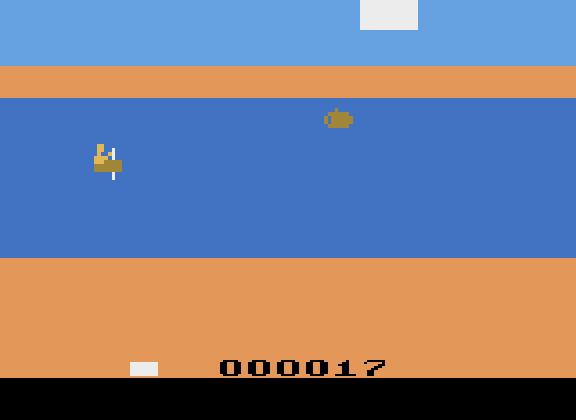 I added a level 7 where the beaver comes at you and follows you. Level 7 is deeper in the Amazon jungle, and I've begun work on a Level 8 which is in the Arctic. You'd think the water would be frozen there, but apparently not since there goes the kayak. And the eskimos are angry at you for kayaking down their river. I need to think of something brown, scary, swims, and is in the Arctic. left difficulty in A position = start at level 1.
b&w/color in b&w position = start at level 5.
left difficulty in B position = start at level 7. Well, you have polar bears up there and walruses. Both are brown(polar bears are rarely actually 'white') and quite dangerous. Edited by fluxit, Wed Mar 6, 2019 4:08 PM. How's this for a walrus? Added levels 9 & 10. After that, the levels loop and levels 1-5 go faster. left difficulty switch a - start on level 8. Made a few changes here and there. Perhaps I should add a couple more zeroes in front of the score? I added some clouds in a few levels. We'll be featuring White Water Madness on tomorrow's (Wednesday) ZeroPage Homebrew stream on Twitch at 11AM PT | 2PM ET | 7PM GMT! Hope everyone can watch! Edited by ZeroPage Homebrew, Thu Apr 11, 2019 7:47 PM.